360’s comprehensive and fun expedition skills course in The French Pyrenees offers a wonderful alternative to the Alps or Scottish Highlands for the aspiring trekker and mountaineer. Whether you’re aiming to trek and climb in winter mountain environments at home or have your sights on Himalayan peaks, there’s no better playground to learn the basic skills for winter mountain travel. 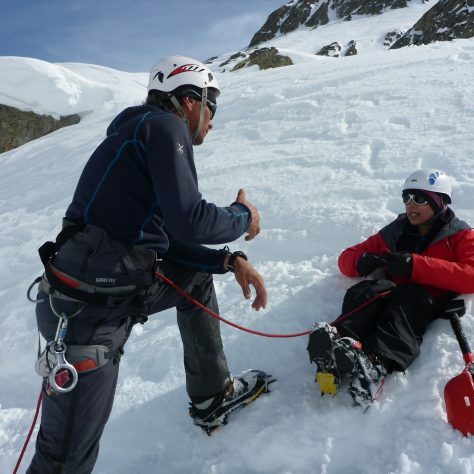 Learning as you undertake a supervised mountain journey, this course will increase your understanding and appreciation of this fantastic environment while building your confidence to be able to move in winter conditions safely and independently. Skills covered include: snowshoeing, safety in the winter environment, self-arrest techniques, assessing avalanche hazards, navigation basics, ice axe and crampon work on varying terrain and conditions, building snow and ice anchors and belays, moving together over snow and ice, construction of snow holes, weather forecasting, basic ice climbing techniques, and mountain ascent in winter conditions. Crucially, this course will enhance your ability to ‘read’ mountain weather and the geographic conditions around you. Throughout the course you will also gain valuable insight into expedition nutrition, clothing and winter camp craft. This is an intense affordable course run by expedition leaders with vast experience, designed to prep you for your next great adventure or just as a week of fun. Settle into your Luchon guest house. Pick up rental equipment (if required). Afternoon rock-climbing session. Familiarisation with equipment and basic climbing and abseiling techniques. Evening briefing covering essential information for the following days, talks on food, personal equipment and group equipment. Weather forecasting. Snowshoe into venue area. This area will always be spectacular but will vary according to local weather and conditions forecast. In the past they have included the Hospice de France, Valle de Benasque and the Vignemale areas. Today we concentrate on learning the art of snow-shoeing and snow safety. We get an understanding about varying snow conditions and avalanche risk assessment. Today we focus on learning and developing mountain skills such as; Self-arresting. Ice axe and crampon work on varying terrain and conditions. Building snow and ice anchors and belays. Moving together over snow and ice. Crevace rescue, the construction of snow holes and weather forecasting. Night in mountain hut, snow-hole or snow camping. Today we begin to consolidate our freshly learned mountain skills by using them to ascend a small peak. You will be closely supervised by your instructors but the focus will be on your own decision-making processes. A summit attempt on the Vignemale (highest peak of the French Pyrenees. 3,298m) or Pico de Aneto (3,404m) is a typical objective chosen for the second day of this period. Both are graded PD in winter conditions. (Alpine grading on the French Alpine scale). A qualified mountain guide will accompany you for these days. Night in mountain hut, snow hole or snow camping. Further consolidation of skills and de-brief on program. Snow shoe out from venue. Transfer to Luchon. Evening celebration meal. Depending on your flight times you can spend the morning relaxing in Luchon or enjoying any of the outdoor activities this beautiful mountain town offers. The weather in winter and in the mountains in general is very unpredictable. This is Plan A and we will try and stick to it, however Plans B, C and even D may be deployed dependent on the weather conditions that we have to work with. Be prepared to be flexible. Depending on the snow conditions and forecast we will be either in unmanned winter quarters in a refuge or in a manned hut with facilities. If we end up taking the more luxurious option of the manned hut you will need €60 for 3 nights accommodation. We will of course, let you know before you head out where we will be. Bring a rucksack with a good waist belt. Ideally, bring the biggest rucksack you have, 60-80L is perfect, ideally an 80L bag. To carry all your kit and a proportion of your week’s food allocation along with your crampons, helmet, ice axe etc. For nights spent in the refuge. The refuge will also provide blankets. Only required if you wish to spend a night in a snow hole. A plastic helmet is more suitable rather than the expanded foam helmets available. Make sure you can wear it with a woolly/fleece hat underneath. If you do not have a climbing helmet then 360 can lend you one. You will be fed very well and given snacks each day however we advise bringing a small selection as a little bit of comfort. For summit day it’s always good to have a few extra chunky bars for that extra boost. Energy gels and protein bars are not suitable. Large plastic bowl for cereals, porridge, soup etc. The food in the refuges is plentiful and of very good quality,often using locally sourced ingredients. Breakfasts consist of pastries, fresh bread and jams and you can expect hearty meals in the evenings. 360 provides some snacks for your days on the mountain, however do bring some of your favourite snacks from home, a range of fast and slow release energy snacks. The pure ‘energy’ style bars which are solid are quite tough to eat on the mountain so go with simple things. Flapjacks, shortbread, sweets, nuts and chocolate are great, snacks that you’re going to really look forward to eating and which will give you energy. Papilio guesthouse is a comfortable lodge that sleeps 10 to 12 guests. The Refuge is dormitory style accommodation but each person will have their own bunk bed. There is minimal risk of altitude sickness on this trek. The idea is to be as comfortable and warm as possible for the night and henceforth to ensure plenty of sleep for the arduous days ahead. A light summer silk liner should be fine for the nights spent in the refuge. The refuge also provides clean blankets. If conditions allow us to build a snow hole and you wish to spend a night in it, then please bring a 4 season sleeping bag rated to -10C. Think about how much of the kit you are likely to use again and what sort of expeditions you are likely to do in the future. The cost of equipment is usually a major deterrent for people coming onto trips in the first place. If you think you will reuse your gear, then it is worth starting to invest in good gear. The old adage often applies – you get what you pay for. Think about the time of year, and how high you are going. While you may swelter at the bottom of the mountains, it can get surprisingly nippy at altitude. Both long sleeve tops and trekking trousers are recommended rather than shorts. Long sleeves and trousers are recommended as a deterrent to insects, scratches from bushes and to act as sun protection. Equally, if you wish to bring short sleeve tops or shorts, that is fine, just be careful. Keep an eye on sunburn. The prevailing conditions of the day on the mountain will dictate what you feel like wearing. And the layering system never fails. If you are cold, put a layer on, if you are hot, take one off. If this is a taster into the world of climbing and trekking, borrow kit from friends, alternatively you can hire it from our partners at Outdoorhire.co.uk at a fraction of the cost of buying kit new. Because of the huge variety of terrain encountered when ascending these mountains it is very important to wear the right footwear. Boots should be sturdy, waterproof, insulated against cold temperatures and offer adequate ankle support.In addition it is highly recommended that your boots are well worn in to prevent the formation of blisters. A wide range of suitable boots are on the market and further advice as to which brand names are available can be found online or at your local outdoor store. The leather / Gore-tex combinations are endless and each with their merits. Our best advice is to try them on – if you think they’re comfortable, and will be for several hours a day, buy them. These are necessary for the climb above 3,000m. To reach the summit you have to climb the ever steepening Aneto Glacier.The ice and snow conditions vary according to the time of the year but crampons and ice-axes are mandatory for each ascent. For crampons non-technical strap-on types will do. If you are using crampons with the more modern heel clip make sure you have boots that are compatible. We recommend the Grivel 10 point walking crampons. A general walking ice-axe is ideal. These can be sourced locally, please let us know in advance and we can arrange it. If you are borrowing or buying a rucksack, ask someone to help you adjust it to fit your back. And ensure you are making these adjustments with weight inside it, not empty. Generally it should sit reasonably high on your back so that the weight is acting vertically downwards, not forcing your shoulders back or drooping past your backside. Again, it is about how you feel comfortable wearing it, so it is important to get it right. Make sure too that it is either waterproof or you have a waterproof cover for your rucksack. It is also advisable to pack your kit in plastic bags/bin liners or waterproof bags before placing them in your rucksack. You should bring a rucksack with you of approximately 60-80L. Ideally an 80L bag. As the idea on this expedition is to mimic as closely as possible conditions on some of the bigger mountain expeditions. Although we will not be camping, you will be carrying (or wearing) your snow-shoes, ice-axe, crampons, sleeping bag, spare clothes, water, cameras etc and a share of the teams food for the week. Altogether this can weigh up to 12kgs and whilst this is just for the walk in and out (minus a lot of the food when you are walking out), it is good to prepare for this! How tough is this course? Just because we’re in Europe and reasonably close to home, doesn’t mean that you’re undertaking a gentle walk in the hills! This is a fairly challenging trek with significant altitude gain and some long days, learning techniques that may be new to you like use of crampons. A greater understanding of expedition travel will be gained as further skills such as expedition nutrition, clothing and winter camp-craft will be demonstrated on the journey phase of the course. Is there a quicker way to climb this peak than the one outlined on your itinerary? Yes there is, we call it the fast and furious. This involves a very long day of both driving and climbing. We leave Papilio guest house at around 3am to arrive at the national park gate at 6am. Then we walk 40 minutes up to the refuge and from there commence the ascent of Aneto peak. We usually summit after a 5 – 6 hr climb and (conditions depending) descend in 3 – 4 hrs. Then its back into the car for a 3 hr drive to Papilio guest house in France. Total time is around 16 to 17 hours. If these do not suit then all you need to know is that we will be at the airport at midday on day one of the itinerary. On the day you leave we will be dropping the team off at Toulouse airport for 3 PM. You must carry individual travel insurance to take part in the course. We cannot take you on the mountain without proof of insurance. What training do we need to do? Being trekking fit before coming to the mountain is of great importance not only to maximise your chances of reaching the summit but much more importantly to enhance your overall enjoyment of the expedition: if you are struggling from day one then you will not enjoy the rest of the trip. Physical preparation does not have to be Herculean: concentrate on cardio vascular exercise during the week by taking short runs when time allows and try to spend at least 2 weekends a month going on good long walks (longer than 6 hrs) carrying a rucksack of around 10kg, and head for the hills. This kind of regime will not only prepare your body for carrying minor loads but will harden your body against the big days on the mountain itself. In addition it will help break in your boots and get used to your equipment. This will pay dividends when you reach the mountains. The refuge doesn’t have WiFi due to its remoteness, but you will be able to get it at the guest house at the start and finish. Mobiles tend to work fine once you get to 3,000m but not at the refuge. I just couldn’t fault either the course content, the organisation or the team that supported it. The week surpassed my expectations and has now cemented my confidence to step up and get stuck into the more challenging expeditions I want to get into. Rolfe, Jo and Huge were superb.